Exactly a year ago I decided to try painting mandalas. This was my first one and I had such a pleasant time getting lost in it. The original is quite tiny (and missing at the moment!) It must still be packed away. This past weekend I planted my nasturtium seeds in their starter pots hoping for blooms like these. When/if they bloom I'll share the pictures on another Blooming Tuesday. So pretty. Such lovely colors. Hope you find the original soon. Too often I tuck things away for safe keeping and do too good a job of it. Years later the safe (and very lost)object resurfaces. 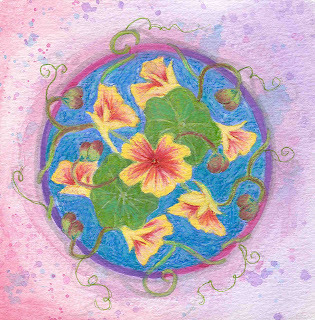 I like the way the tendrils of the nasturtiums sneak out of the mandala. I find mandalas scary and frustrating. I haven't ever gotten into the meditative part of it. HBT. Too beautiful to send or give away! Oh funny, this is a compliment: I saw the mandala and thought it was a gift from Marianne! You did a beautiful job on it and this is one of my favorite flowers. BEEE-U-TEA-FULL! Lo, this is wonderful....and definitely a day-brightener.... not snowing on this Coast - but - rain, heavy wind and brrrrr.....cold temps. My only sun today comes from your gorgeous Mandala! This is so pretty! I love nasturtiums - caterpillars do too! oooh, i never saw this before (now that i consider myself a laurel expert of a fan). Between you and Marianne, I am finding I want to try another mandala. This is really pretty with the flowers and tendrils swirling about! Great colors also!!! i am not sure whether i knew you were a mandala lady, but whatever you do is great! That is beautiful!!!!! Such a lovely job...first one? Hope you have a fabulous Wednesday! Oh my goodness, I love it. So creative and colorful. Love the way everything twist, turns and winds around. Great piece. Gosh, this is pretty. The colors are so refreshing and uplifting. I've tried making mandalas on the computer and gave up. Maybe I should try again. What fun catching up on your Blog. I LOVE the robin in your header!!!! It feels so good to be back online.